All Pinon Hills homes currently listed for sale in Pinon Hills as of 04/25/2019 are shown below. You can change the search criteria at any time by pressing the 'Change Search' button below. If you have any questions or you would like more information about any Pinon Hills homes for sale or other Pinon Hills real estate, please contact us and one of our knowledgeable Pinon Hills REALTORS® would be pleased to assist you. "Gorgeous and beautifully landscaped spacious home situated on a huge 17.52 acres of land in the desirable Pinon Hills community. The home features 4bedrooms and 3 baths with wood flooring, tile flooring, spacious kitchen with center island, granite countertop and stainless steel appliances, master bedroom with vaultedceiling and walk-in closet, master bath with separate shower and bathtub, and ceiling fans throughout. Other features include self energy sufficient solar panels (noelectricity bill), water source from the property with large water tank (no water bill), storage buildings, greenhouses, chicken and duck coops, automatic gate for car access,many different types of flowers, vegetables and trees, and farming equipment such as tractors. Tractors and all equipment included the purchase price. Projected from farm income in 2020." "Beautiful!! Custom home, sports 4 bedrooms, 2 baths, open floor plan, formal dinning room, front room with heat circulating fire place, Kitchen has large pantry, granite counter tops, Appliances, tile that looks like wood floors throughout house, Master bath has just been remodeled, the laundry room has a large soaking sink there is a two car attached garage with a circular drive, and a 3 car detached garage with a shop area. 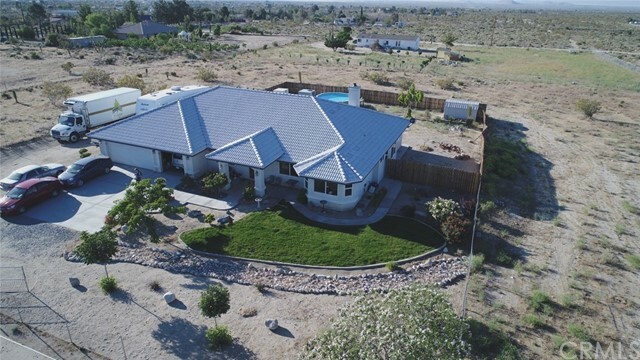 you must see this home it has lots of extras, City Lights & Endless Valley Views this home sits at just above 4500 altitude and has Amazing Sunsets, Star filled nights with Beautiful Clear Blue Skies that surrounds your future Home. A Second house with 2 bedrooms and 1 bath is rented or renters will leave, it is up to you. At present it is permitted for storage, All of this on 2.5 acers. Buyer to verify. Seller Motivated moving out of State." "Beautiful!! Custom home, sports 4 bedrooms, 2 baths, open floor plan, formal dinning room, front room with heat circulating fire place, Kitchen has large pantry, granite counter tops, Appliances, tile that looks like wood floors throughout house, Master bath has just been remodeled, the laundry room has a large soaking sink there is a two car attached garage with a circular drive, and a 3 car detached garage with a shop area. 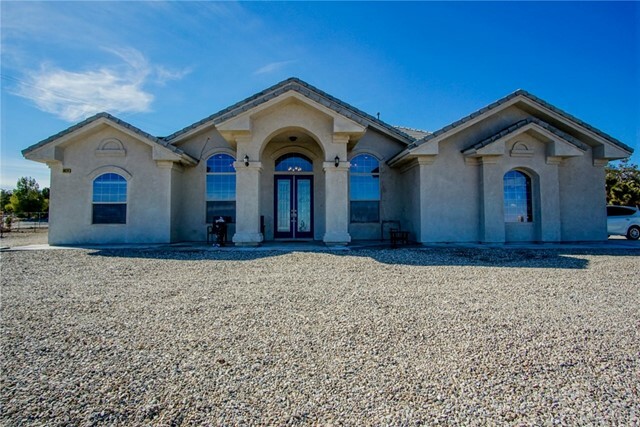 you must see this home it has lots of extras, City Lights & Endless Valley Views this home sits at just above 4500 altitude and has Amazing Sunsets, Star filled nights with Beautiful Clear Blue Skies that surrounds your future Home. A Second house with 2 bedrooms and 1 bath is rented or renters will leave, it is up to you. At present it is permitted for storage, All of this on 2.5 acers. Buyer to verify. 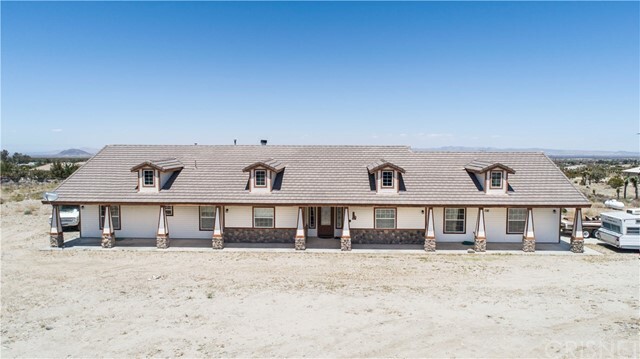 This home is centrally located just 5 miles from down town Phelan, Wrightwood, Palmdale, rancho are all within 25miles and yet it is far enough out that you have country living. Seller Motivated moving out of State. Association Amenities: None # of RV Spaces: 0 Special Features: BN,,CC,,PTRY,TS,,WK,NONEFireplace Features: Heat-O-Later Frontage Type: Dirt Road Lot Location Type: Standard Location Landscaping: Natural Special Features: Cable TV,Garage Door Opener, Underground Util: , Two Homes on a Lot # of Attached Spaces: 2 # of Detached Spaces: 3"
"Location ! Location ! Peaceful Cozy Cabin on Large Land . On Highway 138 with 360 Degree View. Zoned RL This Big Land for your Children and toys!!! Association Amenities: None # of RV Spaces: 0NONE Frontage Type: Dirt Road Lot Location Type: Standard Location Landscaping: Natural Special Features: None # of Attached Spaces: 0 # of Detached Spaces: 0 Construction Materials: Masonry"
"Move in ready. Wonderful South side Pinon Hills Home. Close to pavement, Split floor plan, 2 masters, both have separate entrances . Kitchen has tile floors and counters along with a Huge pantry with a valley view from the kitchen window. Attached 3 car garage PLUS detached double car with workshop. Covered patio and porch. This is a must see. All of this and located in the Snowline School District. Association Amenities: None # of RV Spaces: 0 Special Features: FS,,PTRY,WKNONE Frontage Type: Dirt Road Lot Location Type: Standard Location Landscaping: Partial Special Features: Garage Door Opener # of Attached Spaces: 3 # of Detached Spaces: 2"
"WELCOME TO YOU PRIVATE RETREAT! THIS GATED COMPLEX IS WAITING FOR YOU TO CALL IT HOME. SITTING ON 2.5 ACERS, THE LAND HAS ALL THE ROOM FOR YOUR TOYS! THERE IS A DETACHED 2 CAR GARAGE WITH WORKSHOP, COVERED PARKING FOR YOUR RV OR BOAT, RV HOOKUPS, AND THE 3RD GARAGE WHERE YOU CAN STORE YOUR ATV'S. THE GROUNDS HAVE BEEN MAINTAINED AND MANICURED FOR LOW MAINTENANCE. THE HOUSE HAS AN OPEN FLOORPLAN AND OFFERS ALL THE CHARMS OF THE OLD WEST (THERE IS A FUNCTIONAL IRON STOVE), YET PROVIDES ALL OF THE MODERN AMENITIES. MASTER BEDROOM HAS A WALK IN CLOSET, DUAL VANITIES, SEPARATE TUB, AND SHOWER. ALSO, AT THE OTHER END, THERE IS A LARGE BONUS ROOM THAT COULD BE CONVERTED TO TWO BEDROOMS, IF WANTED. YOU'VE GOT TO COME AND ENJOY THE RADIANCE OF THE DESERT NIGHT AND THE TRANQUILITY OF DESERT LIFE. THE ONLY THING THIS HOUSE IS MISSING ARE YOUR PERSONAL TOUCHES. WELCOME HOME! Association Amenities: None # of RV Spaces: 1NONE Frontage Type: Dirt Road Lot Location Type: Standard Location Landscaping: Sprinklers Special Features: None # of Attached Spaces: 0 # of Detached Spaces: 2"
"WELCOME TO YOU PRIVATE RETREAT! THIS GATED COMPLEX IS WAITING FOR YOU TO CALL IT HOME. SITTING ON 2.5 ACERS, THE LAND HAS ALL THE ROOM FOR YOUR TOYS! THERE IS A DETACHED 2 CAR GARAGE WITH WORKSHOP, COVERED PARKING FOR YOUR RV OR BOAT, RV HOOKUPS, AND THE 3RD GARAGE WHERE YOU CAN STORE YOUR ATV'S. THE GROUNDS HAVE BEEN MAINTAINED AND MANICURED FOR LOW MAINTENANCE. THE HOUSE HAS AN OPEN FLOORPLAN AND OFFERS ALL THE CHARMS OF THE OLD WEST (THERE IS A FUNCTIONAL IRON STOVE), YET PROVIDES ALL OF THE MODERN AMENITIES. MASTER BEDROOM HAS A WALK IN CLOSET, DUAL VANITIES, SEPARATE TUB, AND SHOWER. ALSO, AT THE OTHER END, THERE IS A LARGE BONUS ROOM THAT COULD BE CONVERTED TO TWO BEDROOMS, IF WANTED. YOU'VE GOT TO COME AND ENJOY THE RADIANCE OF THE DESERT NIGHT AND THE TRANQUILITY OF DESERT LIFE. THE ONLY THING THIS HOUSE IS MISSING ARE YOUR PERSONAL TOUCHES. WELCOME HOME!" "PRICE REDUCED FOR THIS FABULOUS ESTATE! This custom built ranch style home is STUNNING and features a 2,614 square foot home with 4 bedrooms, 3 baths, and a 3 car garage situated on 2.17 acres located ideally close to Highway 138. IMAGINE THIS AS YOUR HOME featuring the beautiful front entry door and see this open floor plan that shows you your dining room, opening into your kitchen and living room/family room with the wood burning fireplace in the center of the home; a great split floor plan with the master bedroom with walk in closets and master bathroom with a large corner jet tub and a walk-in shower for 2 with 2 shower heads; Jack and Jill bedrooms and full bath and 1 more bedroom adjacent to the living/family room. The kitchen is fabulous with lots of cabinets, stainless steel appliances, a large center work island, Corian countertops and large walk in pantry; there are ceiling fans throughout; a master cool and an UP DUCT COOLING SYSTEM FOR SUMMER COMFORT. The front lawn is landscaped and natural gas is available in addition to the present propane; and the laundry room is a separate room with lots of storage. Buyers must see to appreciate the love & care the owners have put into this home. STANDARD SALE! No HOA!. SELLERS ARE MOTIVATED AND WANT A FAST SALE! MAKE YOUR OFFER TODAY! Seller reserves services. NOTE: All information is taken from reliable sources and is deemed reliable; buyers to verify!" "Open kitchen, breakfast bar, tile counters and carpet/tile flooring, 4 bedrooms 2 bath, great room with wood burning stove, ceilings fans throughout, french door to covered patio from great room, extra room that can be used as a den or office, large walk-in closet in master, jetted jacuzzi tub, Tiled Walk-in shower in master bathroom. French doors with access to covered patio from master. Additional bedrooms are ample size. Chicken coop to stay but not the chickens,horse arena. Lots of mature trees and plants. 2306 sq ft, 2.29 acs. Central and Evap cooling. Wood burning stove in great room and fireplace in master bedroom. Association Amenities: None # of RV Spaces: 0 Special Features: ,PTRYNONE Frontage Type: Dirt Road Lot Location Type: Standard Location Landscaping: Natural Special Features: Garage Door Opener # of Attached Spaces: 2 # of Detached Spaces: 0"
"Surrounding Views of Mountain and Desert Valley.Located on South Side of Pinon Hills Custom 2 story LOG Home. Open LOG Beams. Family room with custom built in LOG Entertainment area. Many unique places in this home. Covered patio with rock wall. Do not miss the Panoramic views of this Custom Log Home!!! Beautiful fenced property with custom gate. 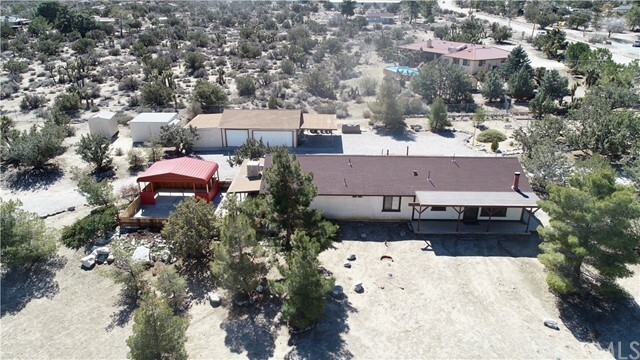 Zoned for horses, located in the popular Snow Line School District and within 15 minutes of Mountain Hi Ski Resort and the quaint town of Wrightwood, with restaurants, bars, shops and hiking trails. 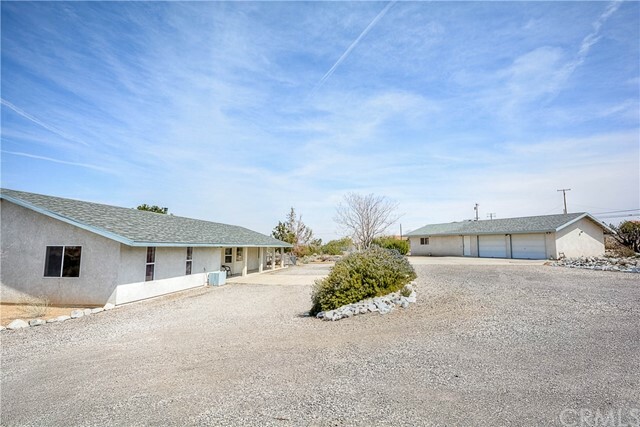 Association Amenities: None # of RV Spaces: 0 Special Features: BN,SHNONE Frontage Type: Dirt Road Lot Location Type: On Equestrian Area,Standard Location Patio and Porch Features: Covered Deck # of Attached Spaces: 0 # of Detached Spaces: 0"
"Desert living at its finest. The views are breathtaking. This immaculate home with its 4 bedrooms, 3.5 baths. It shows light & bright in every room. Set on 2.1 acres, has a covered porch & patio. With its 3 car garage & limitless parking. This home is in pristine condition. The details show the love & care owner put into it. Duel pane windows, duel thermostat, central air and heat, extra wide hallway. Master Bedroom has custom fireplace, on suite that has two separate wash basins, large corner jet tub, walk in shower for two, walk in closet, additional storage. Laundry room off the garage w/built in cabinets, wash basin & counters for laundry folding / crafting beneath. Formal dining area looks out the back of property with its Joshua trees and the desert valley. Kitchen window looks out towards San Gabriel mountains. The great room boasts a rustic stone fireplace, vaulted ceiling. Every sunset view from this home is worthy of a framed photo. Come make this home your own." "You are viewing a gorgeous home that is in the Deer Haven area.. South Pinon Hills. There are breathtaking views in the evening , amazing sunsets..giving you the best of both worlds and the views of the mountains on the south side , the north side views of the desert. Lot size is 1.50 acs but nets 1.17 acs, due to the San Bernardino County Drainage Easement on the east side of property. 4 bedrooms,split floor plan, with the guest and bathroom area perfect family and guests. Total of 3 baths, 3 car garage, fenced and partially fenced with good size area for pets. Nice size kitchen with lots of cabinets/storage and a quaint breakfast kitchen nook... There is a Separate dining room with built in china cabinet which opens up to the formal living room. A Cozy Den with a wet bar, A pellet stove to keep you warm on those cool evenings. Easy access to Highway 138. Located in the highly accredited Snowline School District. You will not be disappointed. Home is equipped with alarm system Association Amenities: None # of RV Spaces: 0 Special Features: BN,,PTRY,WSEC,SH,WBNONE Frontage Type: Dirt Road Lot Location Type: Standard Location Patio and Porch Features: Covered Deck Special Features: Garage Door Opener # of Attached Spaces: 3 # of Detached Spaces: 0"
"Welcome to Pinon Estates! This is our second of homes to come in 4 cul-de-sacs in the gorgeous Pinon Hills Community...where the Desert meets the Mountains! Our exclusive home has been built by Covington Construction, one of the most sought after, premier builders in the High Desert! Our gorgeous open-concept design is beautiful and modern. You will fall in love the minute you enter this home! This home is built for entertaining with a gourmet kitchen, granite counters and everything a cook would dream of! There is a long counter with space to seat at least 4 people comfortably and a separate dining area with bay windows. The split bedroom floorplan has a spacious Master's Suite with a gorgeous bathroom at one end of the home for privacy and three additional bedrooms and two beautiful bathrooms are on the other end of the home. The Master Bath room has an enormous walk-in closet, a beautiful custom-tiled shower and a beautiful garden tub. You will absolutely LOVE the tile flooring. Bedrooms and living areas are beautifully carpeted, while halls and walkways, kitchen, dining, bathrooms and laundry are tiled to look like rustic wood flooring. Our patio has a built-in barbecue and is stucco'd with recessed lighting and is perfect for having a dinner party. Our garage is completely finished and has two spaces for your vehicles. Estimated completion June 2019. Pics are of the first home 2160 sf which is closing escrow soon. Last pics are of this home with floor plan. Association Amenities: None # of RV Spaces: 0 Special Features: CC,FS,,PTRY,NONE Frontage Type: Dirt Road Lot Location Type: Standard Location Landscaping: Natural, Partial Special Features: Garage Door Opener, Underground Util: # of Attached Spaces: 2 # of Detached Spaces: 0"
"This beautiful custom home boast a split floor plan, arched ceilings, wood laminate flooring, gorgeous fireplace, the kitchen offers granite counter tops and opens up into the family room, this house has Speaker Craft surround sound, this is a great house for entertaining family and guest! Garage has epoxy floors and plenty of room for your cars and toys. Too many extras to list! Association Amenities: None # of RV Spaces: 0 Special Features: PTRYNONE Frontage Type: Dirt Road Lot Location Type: Standard Location Landscaping: Natural # of Attached Spaces: 3 # of Detached Spaces: 0"
"Brand New, Gorgeous Stick Built Home near HWY138 and close to paved Oasis Rd. Association Amenities: None # of RV Spaces: 0 Special Features: FS,,PTRYNONE Frontage Type: Dirt Road Lot Location Type: Standard Location Landscaping: Natural Special Features: Garage Door Opener # of Attached Spaces: 3 # of Detached Spaces: 0"
"Big price reduction! 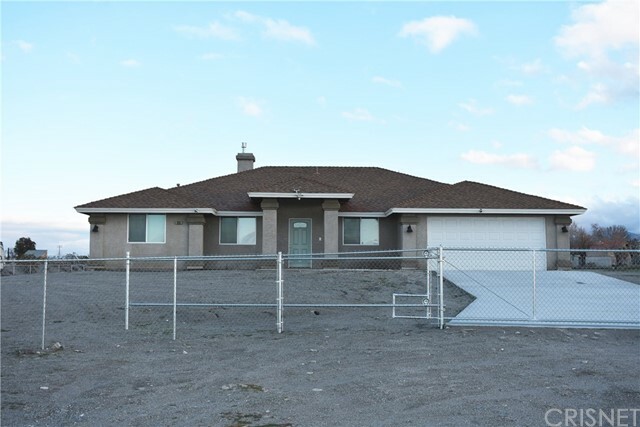 !Three Bedroom two bath home in Pinon Hills. Nice deck with great view and plenty of room for the whole family. This home has a brand new concrete septic tank. Come and see this one today. Association Amenities: None # of RV Spaces: 0 Special Features: SKNONE Frontage Type: Dirt Road Lot Location Type: Standard Location Patio and Porch Features: Balcony # of Attached Spaces: 2 # of Detached Spaces: 0"
"Snuggle up in front of your wood burning stove in the winter in this beautiful home that sits at an elevation of @4200 feet so you get an amazing view of the mountains from your back patio and the Victor Valley from the front. Vaulted ceilings in the great room and kitchen. The kitchen has a large ceramic tiled counter space and a walk-in pantry, with an arched entry into the formal dining room. The Master bedroom has an arched entry to the Master Bathroom, which has a walk-in closet, a dual sink vanity, an oversized soaking bathtub and a separate walk-in snail shower. The wood burning stove and evaporative cooler help with keeping the utility bills. This home has natural gas, NOT propane. It has a gas outlet on the back patio for your barbecue and electric outlets on both front and back patios. The approx. 700' garage has double doors so you can park 2 cars and still have space for your workshop/man cave. It is wired for TV and has 110/220v electrical outlets. The house is freshly painted inside and out, the windows have been re-caulked, a new water heater was installed last summer and the kitchen counters have a new stain and sealer on the grout. The property is fully fenced with chain link and has complete RV hookups at the back of the property. Association Amenities: None # of RV Spaces: 0 Special Features: BN,CC,,PTRY,TS,NONE Frontage Type: Dirt Road Lot Location Type: Standard Location Landscaping: Natural Special Features: Garage Door Opener, Underground Util: # of Attached Spaces: 3 # of Detached Spaces: 0"
"Listed below appraised value!!! Walk into this home with equity!!! Calling all snowboarders, skiers, horse lovers, dog lovers, off-road enthusiasts, rock climbers, hikers, fisherman, wakeboarders, and stay-cationers. Enjoy picturesque sunsets and breathtaking panoramic mountain and desert views from the Trex decking. This cabin is nestled in Deer Haven on a fully fenced 2.32 acre lot complete with an additional fenced enclosure. 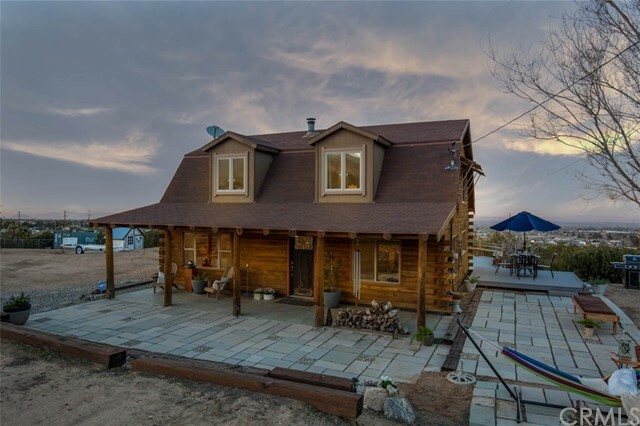 It is just 7 miles from the quaint town of Wrightwood and Mountain High Ski Resort, 15 miles from Silverwood Lake, and a few miles from the famous Mormon Rock. Eye pleasing is the industrial chic design. This home includes two full bedrooms, a sleeping loft, two bathrooms, a formal dining room, living room, kitchen, and a game room! Architectural plans have been engineered to add an additional 1500 ft. . Soy spray foam insulation was used to seal the envelope in the house to make it weather resistant. The temperature is 20 higher in the house in the winter time and 20 lower in the house in the summertime. Cozy up to the whimsical wood burning stove or open the kitchen Dutch door to enjoy the breezes. It also has a Fire pit for those nights you want to make s mores, a skateboard ramp, and a large horseshoe pit. You don t even have to leave the property -there is plenty of entertainment. If it s peace and quiet you want - you can have that too. Neighbors are private, yet friendly. Come view this unique property and fall in love." "Beautiful Custom 4 bedroom 2 bath home with over size 3 car garage on 2.75 Acres. Great Floor Plan w/outstanding features.Large Master Suite, Walk - in Closets, Gourmet Kitchen,Granite Counters,Tile Floors, Carpeting, Central Air & Heat with fire place in family room with 9ft ceilings thru out home. Lots of room for your off road toys. Close to mountain resorts with skiing,fishing, hiking and more.This is a must see home please show and sell. please leave card and thank you for showing." "Gorgeous Home, Gorgeous views! This well maintained home features separate living and family room with fireplace, formal dining and breakfast nook. Open concept kitchen with granite counters and stainless steel appliances. Indoor laundry room with storage. Oversized master bedroom with walk in closet. Master Bathroom has separate soaking tub, shower and double sinks. All bedrooms are very spacious. New carpet throughout. Huge 3 car garage with extra working space and a backyard covered patio. One block from pavement. Completely fenced. Home qualifies for USDA loan, 0 down! Breathtaking views of the San Gabriel Mountains, Minutes to Mtn High, walking distance to Pinon Hills Elementary. This home is in the award winning school district of Snowline Unified School District. Beautiful desert sunrises, sunsets and clear night skies just right for star gazing. This home is amazing! You will not be disappointed. Association Amenities: None # of RV Spaces: 0 Special Features: BN,CC,,PTRYNONE Frontage Type: Dirt Road Lot Location Type: Standard Location Landscaping: Natural Special Features: Garage Door Opener # of Attached Spaces: 3 # of Detached Spaces: 0"
"Amazing Single Story in Pinon Hills!/Located at the End of a Cul-de-Sac Street/Entire Home was Completely Redone in 2017!/3 + 2/1899 SF/Comp Roof/Stucco Exterior/Wood Trim/Estate Lights/2-Car Garage/Shows Like a Model!/Lots of Designer Touches Throughout!/Gorgeous Laminate Wood Flooring!/Quartz Countertops and Breakfast Bar!/Carrera Marble Backsplash!/Family Room with Fireplace/Central Air-Heat/Ceiling Fans/Indoor Laundry/Alarm System/French Doors/Master has Jetted Tub - Separate Shower/Double Sinks/Covered Patio/Fully Fenced/Horses OK!/2.47 Acre lot!" "Great South side Pinon Hills location. Split floor plan, Master has nice size walk-in closet , Great storage space in kitchen. And endless views of the Valley and Mountains. Home does need a little TLC but not much.Detached barn style building is great for extra storage and work shop. Seller is motivated. More photos to come! Association Amenities: None # of RV Spaces: 0 Special Features: BA,FSNONE Frontage Type: Dirt Road Lot Location Type: Standard Location Landscaping: Natural # of Attached Spaces: 2 # of Detached Spaces: 0"
"Pinon Hills hone with fantastic views of the mountains and valley. Huge 2.7 acre lot on paved roads. Enjoy the feel of tranquil rural living while being only minutes from everything. Great commuter location just west of 138. 3 bed 2 bath home with a 3 car detached garage with plenty of electrical outlets makes a perfect workshop to build cars, bikes or anything else! There are also multiple large storage buildings. Plenty of room for RV's and all the toys you can think of! Enjoy the views and fabulous desert sunsets every evening from the multiple covered patios and outdoor sitting areas. Fully fenced lot with drive through access." "The perfect home for the Hot Rod / Muscle Car enthusiest or woodworker looking to set up the perfect woodshop.. Or whatever you can imagine for this great space. Located close to paved Phelan Rd., this property features a gorgeous 4 Bedroom 2 Bath home that has been well taken care of and it shows. This home offers a spacious kitchen with seperate Living Room and family Rooms. It is powered by a compltely paid for solar system to keep monthly electric bills at a minimum. The fully fenced 2.5ac +/- parcel with 2 gates in front and a circular driveway has a wonderful view of the valley looking north and a breathtaking view of the mountains to the south/west. 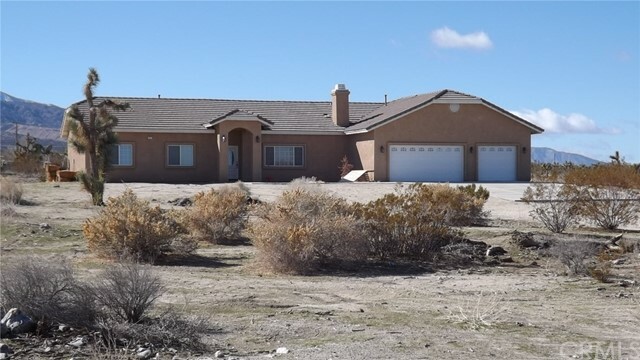 Besides a wonderfully desert scaped yard this property has a magnificet 1,200sqft shop that includes a 1/2 bath. And for more storge there is a qality 10'X12 shed that is built on a slab. This home is a must see! Association Amenities: None # of RV Spaces: 0 Special Features: SH,WKNONE Frontage Type: Dirt Road Lot Location Type: Standard Location # of Attached Spaces: 0 # of Detached Spaces: 4 Construction Materials: Perm w/o 433"